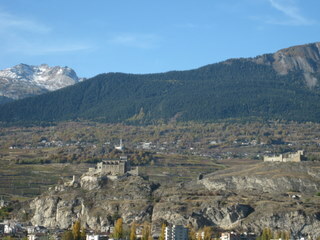 High above Brig in Switzerland’s southern canton of Valais is a tiny village named Mund. Nothing remarkable about the place at first sight – just a few houses on a scrubby hillside above the valley, a handful of Spycher, the typical Valaisan wooden storage huts, a primary school, an ancient and a modern church. But in the 1980s, Mund shot to stardom on account of its one product: saffron. Records show the precious spice has been cultivated here since the 14th century, but over the centuries production dwindled to almost nothing. 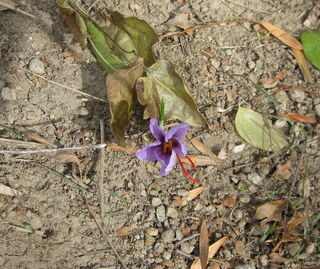 By the mid-1950s, saffron cultivation seemed doomed to become a distant folk memory. It took the construction, in 1979, of an incongruous, unsightly road snaking up to the village from Brig below to breathe new life into the saffron story. The inhabitants of Mund were signally unconvinced by the supposed benefits that would come from a new road – too big, too ugly and altogether surplus to anyone’s needs. Worse still, it turned out that a swathe of the best saffron fields (which hardly anyone was aware of at the time, and apparently cared less about) would be intersected in no less than three places by the hairpin bends of the offending highway. A militant band of Mund-dwellers and local enthusiasts swung into action with a plan to resurrect the village’s ancient tradition of saffron-growing. A Safranzunft or saffron-grower’s guild was born. Potatoes were yanked out, goats and sheep were summarily removed to adjoining pastures and the steep, sandy hillsides were planted with countless bulbs of Crocus sativus. The road went ahead anyway. 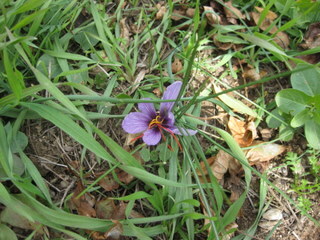 But it turned out to be the unlikely catalyst that led to the renaissance of the now famous saffron of Mund. 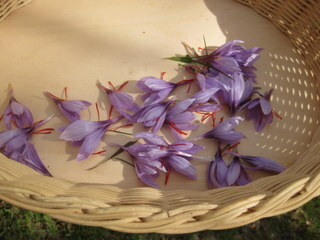 Today, some of the saffron-growers are Mund residents whose day jobs are down in the valley. Others, like Josef-Marie and Marlis Chanton, celebrated wine-growers in Visp, are enthusiasts who’ve been on the saffron case from the start. They’re delighted to see this ancient tradition revived. I joined them one year at the end of October to help pick some of the precious blooms. We parked the car on the side of the offending road, let ourselves in through a gate and scrambled up a steep path. Soon, in the scruffy, sandy soil of the almost vertical hillside, interplanted with rye (“to help prevent soil erosion”, explained Marlis), we began to spot the beautiful pale mauve blooms streaked with deeper purple. There’s a painfully short window for the harvest, explained Marlis, typically from around mid-October till the end of the month. We stooped to pinch out the blooms one by one and laid them reverently on paper towels in our basket – thirty flowers from one small field, twenty-seven from another. For one gram of dried saffron – the amount you can balance on the point of a knife, or one-fifth of a teaspoon, and the smallest amount required to satisfactorily perfume a dish – around 150 blooms are required. The stigmas – almost always 3, sometimes 4 and very rarely 5 – hang out between the petals like little tongues, deep rusty red in colour and wholly devoid – at this stage – of any aroma. The fabulous perfume of saffron develops only when the stigmas are laid out to dry, a process that was carried out traditionally in Mund on top of the tiled wood-burning stove in the front room. Before we left, Marlis pressed a tiny envelope of the precious stigmas into my husband’s hands, dried from the 2010 harvest. “Make it into a tea”, urged Marlis, “it’s wonderful for the digestive system”. Tea? No way. I had other plans for his stigmas. 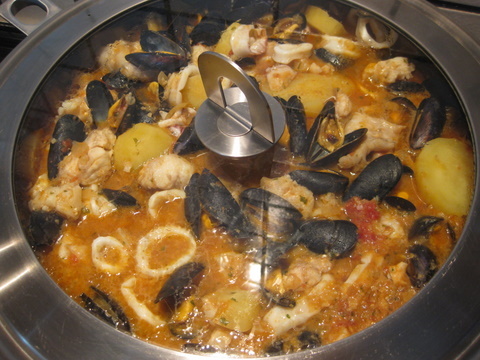 Instead I spirited them into a suquet, a succulent fish stew from Catalunya that’s thickened with an almond picada and perfumed with saffron.